After bursting onto the scene in his redshirt sophomore season at Boise State following a one year stop at the junior college level, James Webb III saw some modest improvements to his stat line after returning to school. After averaging 20.1 points and 11.2 rebounds per 40 minutes pace adjusted, the 22 year old declared for the NBA Draft with the hope of hearing his name called come June. To handle the rigors of a nightly NBA schedule, Webb will quickly have to change his body as the 6'9 wing player has a very wiry frame measured at just over 200 pounds. He has to fill out his frame to be able to match the physicality of professional players if he wants to be able to hold his own. That said, the rest of Webb's physical profile is what NBA teams are looking for in a versatile wing player who has the potential to play both the small forward and power forward positions. He's 6'9 with a 6'10 wingspan with above average quickness and tremendous explosiveness to match his height and length. If he can add some strength to both his upper and lower body, it's easy to project him as a NBA level athlete. Webb took on a larger offensive role in his junior season as he saw his usage rate increase from 18.9% to 25.3% but this came at the expense of his efficiency as his true shooting percentage decreased from 65.8% to 57.3%. After an excellent perimeter shooting season where he converted 40.9% of his 3.7 three point attempts per game, Webb took a giant step back in his junior season as a perimeter threat. In a similar sample of 3.5 attempts per game, Webb's three point percentage plummeted to 21.9%, which is by far the lowest mark in our top-100 prospect rankings among players with at least three attempts per game. This was a prolonged slump as he failed to crack 24% in any single month throughout the season. His shooting form definitely needs some work in several areas as his elbow can flail out, he doesn't always complete his follow through, and he sometimes fails to get enough lift on his shot. Even when he was making perimeter shots, there were questions about his ability to move back to the NBA line with the same accuracy. His accuracy collapsing as a junior only raised the level of concern and Webb will have a lot to prove as a shooter leading up to the draft. Webb is a capable scorer inside the arc, especially around the rim. His 61.6% two point percentage ranked sixth among all players in our top-100 with Webb benefiting from his shot selection. Nearly all his attempts came around the rim with Webb taking very few mid-range and long twos. He's an elite finisher around the rim using his athleticism to get out in transition while also being a great off-ball cutter, exploding to the rim for dunks. He became much more confident absorbing contact around the rim as he increased his free throw attempts from just 2.8 to a more respectable 6.7 per 40 minutes pace adjusted. He converted only 67.8% of his free throws in his two year career, raising more questions about his outside shooting ability. Webb is still learning how to create shots in the half-court, a role he is not currently comfortable in either on the perimeter or from the post. He's hesitant to dribble drive because he isn't overly skilled at putting the ball on the ground to beat his man. While he can take smaller guys to the block, he doesn't have an advanced post game and will get pushed away from the basket. On top of that, he's a poor passer, averaging just 1.3 assists per 40 minutes pace adjusted. He will need some time to develop his shot-creation skills, even if it seems more likely he will end up filling a transition finishing, catch and shoot type role. Webb's athleticism is on fully display defensively and with his high energy, he flies around the court looking to make a play. He crashes the glass to pull down 8.4 defensive rebounds per 40 minutes pace adjusted, and although he isn't a physical rebounder, he can meet the ball at its highest point to help his team. He doesn't block a ton of shots with just a 2.6% block rate but he can surprise people from the weakside from time to time. He plays the passing lanes well to create steals, although this gamble does put him out of position a little too often. The rest of his defensive potential is still developing and he will need to become stronger before he will make much of an impact guarding any position. He gets pushed out of the way when trying to guard dribble penetration or post play, which can get him into foul trouble when he is overmatched. His fundamentals and awareness are pretty poor, as he can get lost off the ball, get beat too easily off the dribble and close out of control to take himself out of the play. He has a nice foundational base of physical tools, effort level and rebounding prowess to become a strong defender, but he has a ways to go before he realizes his potential as a plus defender. He's relied too much on his athleticism in his individual guarding assignments and will need to put more stock into improving his fundamentals to slow down NBA players. Webb is a bit of an enigma due to his polar opposite shooting performances in his two seasons at Boise State. He didn't take some of the steps forward NBA scouts were hoping for after an impressive first year, which leaves him having to prove himself in workouts leading up to the draft and throughout summer league and training camp if he wants to earn a roster spot for next season. James Webb III came out of nowhere last season to become a focal point on both ends of the floor for the upstart Boise State Broncos, who surprised many by tying San Diego State for first in the MWC. A late bloomer who didn't garner much attention in high school, Webb eventually played a year of JuCo at North Idaho in order to fulfill his academic requirements before enrolling at Boise State last fall. In his first season with the Broncos, Webb established himself as an elite-level role-player, averaging 15.7 points and 11.2 rebounds per-40 minutes  en route to winning the Mountain West's Newcomer of the Year Award. At 6'9 and with a 6'10.5 wingspan, Webb certainly possesses the height and length to play forward in the NBA. He's quite wiry, weighing around 200 pounds, but he possesses an advanced rebounding aptitude for someone his build. In fact, Webb's calling card as an NBA prospect is his unique combination of athleticism, strong rebounding, budding perimeter shooting, and encouraging defensive potential, even if his frame is something teams will want to see continue to improve as time moves on. Webb pulled down 11.2 rebounds per-40 minutes in his first season in D1, but even that rate fails to explain just how adept he is on the boards. He grabbed 26.9% of all available defensive rebounds as a freshman  the second highest rate in DX's top 100 prospects database. Offensively, Webb was often asked to stray out onto the perimeter as a floor spacer, mitigating what may have been a similarly impressive offensive rebounding rate. Webb is a tremendous athlete, able to get off the floor quickly and effortlessly, resulting in a number of highlight reel plays last season. Webb thrives on put-backs opportunities, simply because he can jump twice in the same amount of time it takes opponents to jump once. He combines elite athleticism with a terrific motor, as he's constantly battling in the paint for loose balls, despite not possessing a very strong frame. Webb's offensive potential is intriguing. He made 45-of-110 (40.9%) three point attempts last season, proving he has the confidence and touch to score consistently from the perimeter. He's not the smoothest player on the offensive end, lacking the ball-handling skills needed at this point to do much off the dribble against a set defense. While he shot a very high percentage last season, his mechanics could use some tinkering, as he has a tendency to get streaky at times. After starting the season shooting 30/61 from 3-point range in the first 19 games of the season (49%), he finished shooting just 15/49 (31%) in the last 11 games. Webb shoots a bit of a slingshot type jumper, contorting his body sideways and shooting off the side of his hand at times, which is somewhat of a concern projecting out to the longer NBA 3-point line. He doesn't always get the same elevation on every attempt, and is strictly a stand-still shooter at this point, with almost all of his jumpers coming with his feet set last year. While there is a lot to like about the way Webb shot the ball in his breakout season last year, teams will want to see another year of consistent shooting to gain a larger sample size and eliminate any potential flukiness. More than just a floor spacer, Webb is also effective offensively on the interior as a finisher. Per Synergy Sports Technology, Webb scored on 63-of-92 (68.5%) field goals around the hoop. He runs the floor like a man possessed, and has impeccable timing on his release in traffic (attributed to his hang time in the air) and gets off clean looks against tall defenders. He puts up off-balance wild shots at a slightly concerning rate considering he only gets to the free throw line 2.7 times per-40 minutes. He will need to learn how to embrace contact down low rather than use his lankiness to avoid it. Webb was rarely asked to create much for himself or others off the dribble last season, with his usage rate ranking just fifth on Boise State last year. He averaged just 0.8 assists per-40 minutes last season, including a paltry 4.3% assist rate  one of the worst percentages among prospects in DX's database. He's not particularly turnover prone (just 1.3 turnovers per-40) but as someone who projects to play at least some minutes on the wing at times, scouts would like to see a little more ability to create off the dribble. Boise State may need him to do that this year with senior leader Derrick Marks off to the pro ranks, so it will be interesting to see whether Webb can handle a bigger role offensively. Defensively, Webb was inconsistent at times, but has all the physical tools to improve tremendously. Last season, Webb's defensive flaws were mostly due to his lack of experience and strength, and certainly not due to a lack of effort. He'd lose focus on rotations and often over-pursue on double teams, allowing his man to get off clean looks from the perimeter. As expected, he gets bullied on drives and in the post against stronger players, which is a concern if asked to spend time at the power forward spot like he often is at the college ranks. Often ceding at least 30 pounds to his matchup, Webb allows deep seals and would benefit greatly by adding weight to his lower body and core. He uses his length conservatively to disrupt opponents' looks but he's not particularly foul prone, which is a pleasant surprise considering how often he's challenged in the paint. On the perimeter, he isn't always as disciplined as you may hope. He's inconsistent with his stance and his footwork laterally isn't refined. He can use his length to catch up in certain cases but he will need to improve his mechanics to improve balance when he's matched up against faster and stronger players at the next level. With that being said, the length and quickness will always be an impressive foundational asset for his defense. Overall, Webb's unique skill-set will catch the attention from NBA teams. He has potential to be a two-way player with enough length and perimeter shooting to play multiple positions at the next level. He will need to add significant weight to his frame and show his perimeter shooting is for real while playing a bigger role than he did as an anonymous redshirt sophomore. Nonetheless, with his combination of size, athleticism, competitiveness and budding skill-level, Webb's future certainly looks promising. 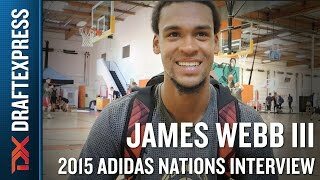 An interview with Boise State power forward James Webb III at the 2015 adidas Nations in Los Angeles.